The Financial District, nicknamed FiDi, is widely considered the leading financial center of the world. Financial District office space houses many of New York City’s financial institutions–banks, insurance companies and other large corporations–such as the New York Stock Exchange (the world’s largest stock exchange by market capitalization) and the Federal Reserve Bank of New York. Giants such as Goldman Sachs, Deutsche Bank and American Express already work out of the Financial District, as do many startups and mature mid-size firms. Given the available inventory, accessibility via public transit, and low asking rents, the Financial District has appeal to a range of businesses inside and outside the financial services world. FiDi has some of the most affordable office space in the city. On average, Financial District office rent comes out to $64 per square foot in Class A buildings, and $51 per square foot in Class B buildings. These are significantly cheaper than average asking rents in popular neighborhoods such as Flatiron District, Plaza District, Hudson Square, Chelsea, and SoHo. With a vacancy rate of 12.3%, above the city average of 10%, and more than 100 million square feet of office space in the Lower Manhattan sub-market, there’s plenty of options for businesses to choose from. The neighborhood is perhaps best known for Wall Street, where workers earn 21.9 percent of wages of all of New York City. Geographically, Wall Street is an eight-block-long street located between Broadway and South Street. 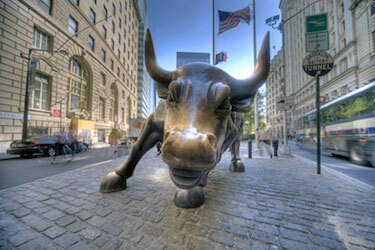 People tend to use the term “Wall Street” to discuss the United States’ financial markets and industries overall. 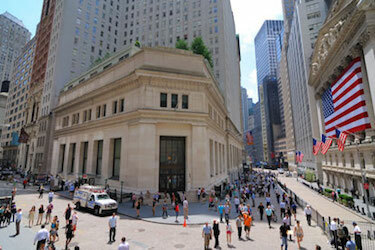 In addition to NYSE, several other major exchanges have or had headquarters in FiDi. These include NASDAQ, New York Mercantile Exchange, New York Board of Trade, and the former American Stock Exchange. The Financial District is also famous for its concentration of skyscrapers. The area boasts more than a dozen standing taller than 630 feet. These include but are not limited to: One World Trade Center (the largest building in the western hemisphere), 3 World Trade Center, 4 World Trade Center, 40 Wall Street, 28 Liberty Street, 50 West Street, One Liberty Plaza, 20 Exchange Place, 200 Vesey Street, 225 Liberty Street, and 1 New York Plaza. The Financial District and Lower Manhattan make up the fourth largest central business district in the United States, trailing only Midtown, the Chicago Loop, and Washington, D.C. You can find companies such as Morgan Stanley, Citigroup, AIG, Conde Nast, Goldman Sachs, Spotify, Group M, and JPMorgan Chase, among other big names crunching numbers on Wall Street. Many startups are leaving Midtown to take advantage of the cheaper rents in the Financial District, including VC-backed x.ai, Olo, Namely, and LifeBEAM. Employees working out of office space in the Financial District, Water Street Corridor, and World Trade Center enjoy a range of convenient public transit options to get around Manhattan or to Queens, Brooklyn, The Bronx, Staten Island, or nearby suburbs. Commuters can take the 1, 2, 3, 4, 5, 6, A, C, E, R, W, J, and Z trains, the Staten Island Ferry, East River Ferry, or the PATH Train. More than 25 percent of working individuals in the Financial District work in finance or insurance. During the day, FiDi comes to life with thousands of young professionals climbing the corporate ladder and tourists seeing the sights; at night, it tends to become calm and quiet compared to other areas of the city. 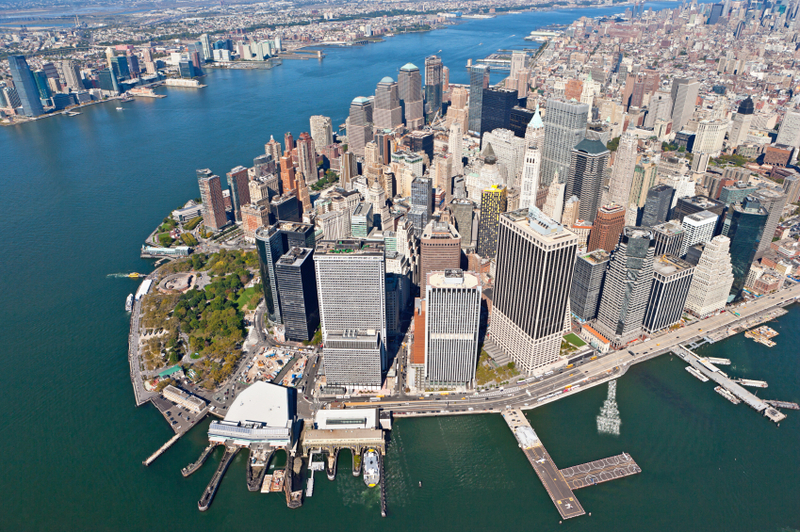 More than 48,000 people live in the Financial District, and the average household income is $191,807. Almost half of residents hold a college degree, and more than 30 percent have a graduate degree as well. Popular buildings for Financial District office space include 11 Broadway, 80 Maiden Lane, The Western Electric Building at 222 Broadway, and The Home Insurance Plaza at 59 Maiden Lane. Our brokers have also helped tenants find offices in 85 Broad Street, 80 Pine Street, and The Insurance Building at 111 John Street. The Financial District is one of Manhattan’s oldest neighborhoods, and roughly overlaps with the boundaries of the New Amsterdam settlement of the late 17th century. The corner of Wall Street and Broad Street is often considered the heart of the neighborhood. FiDi is loosely defined as the area south of City Hall and East of Battery Park and Battery Park City.In the early 20th Century, the northeast corner of FiDi was known as the Insurance District, named for the large number of Insurance firms headquartered there. If you want a break from the stresses of work, check out the South Street Seaport, a historic district with shopping, gorgeous views of the Brooklyn Bridge, New York City’s first luxury movie theater and plenty of places to eat. Looking for a place to meet up with a client? Popular business lunch destinations in the Financial District are the Blue Ribbon Federal Grill, Broadstone Bar & Kitchen, and Trinity Place. For more recommendations of things to see, do, eat, and drink in the area, check out our Best of FiDi local guide and our team’s favorite Financial District coffee shops. The Statue of Liberty, a famous tourist destination on Ellis Island, overlooks the Financial District. View it across the channel from Manhattan or take a Statue Cruise across the channel to see one of the country’s most popular landmarks up close. France gave the USA the 152-foot high iconic landmark in 1886.